Home / Technology / Converge Microbiz: Upgrade to Fiber. Upgrade Your Business. Converge Microbiz: Upgrade to Fiber. Upgrade Your Business. As entrepreneurs of budding businesses, the daily challenge has always been “how do I take my small business to the next level?” In the hit-and-miss nature of merchants, one thing has always proven to be key: the stability that efficiency brings. In an all-digital era, the ability to efficiently connect, process and work online is as vital as they come. That is where a constantly reliable and consistently fast internet connection is the answer. And the answer for your small business is Converge MicroBiz. 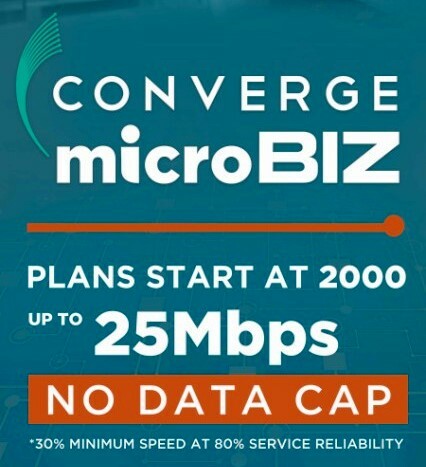 Converge Microbiz is the premium fiber internet designed to upgrade your business. Running on pure end-to-end fiber internet, it treats small businesses with the premium service quality that it truly deserves. Plans start at P2000, up to 25Mbps with no data cap. Boost productivity, never miss opportunities and enjoy the fiber internet designed to upgrade the way you run your business. Considering that entrepreneurs’ time is so valuable, having a dependable internet connection allows them to focus more on productive tasks rather than waste time with lags that has been the status quo for other providers. Both have an installation fee of P2,500, a lock-in period of 24 months, and a guarantee of 30% minimum speed at 80% service reliability. Converge MicroBIZ is the fiber connectivity that means business. Get the internet that works for you. No business is too small for connectivity this big. Boost your business with Converge Fiber Internet. Inquire about the Switcher Program and avail of the exciting advantages your business deserves. For details, call Converge ICT at (02) 6670848, visit their website (www.convergeict.com), or follow them on Facebook, Instagram, and Twitter (convergeofficial).